¡Ay, caramba! 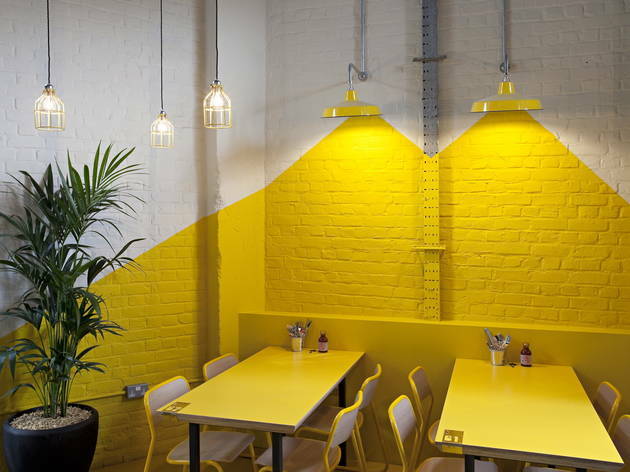 A Mexican restaurant with not a sombrero in sight – just lashings of tasty and fashionable fast food, in a stylish setting just off Brick Lane. The ‘DF’, in case you were wondering, stands for ‘Distrito Federal’ – what Mexicans call the conurbation of Mexico City, a vast sprawl bigger than Greater London. 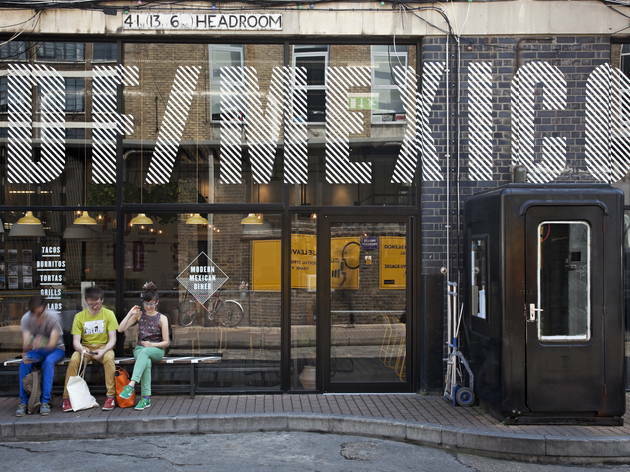 Not that you’ll find many Mexicans in this Whitechapel namesake. Plenty of attentive graphic designers and off-duty DJs, maybe, but not many Spanish-speaking North Americans raised on corn, beans and chili. For DF is very ‘London’. 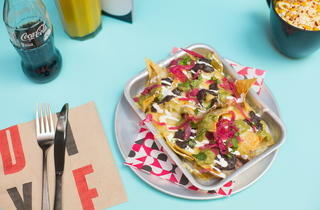 It’s a fashionable and affordable modern Mexican diner created by the Wahaca chain. 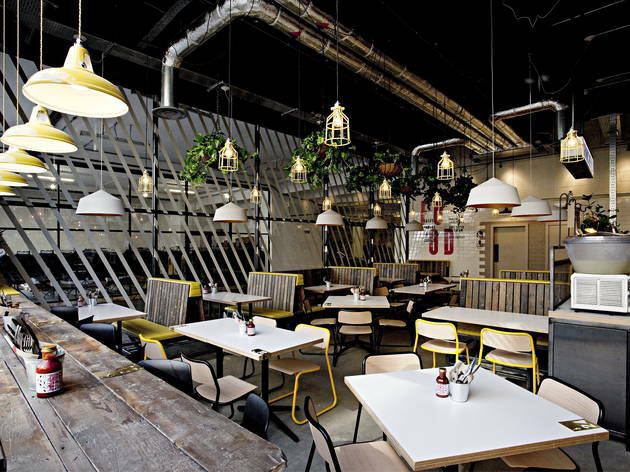 They are dabbling in something even more mass-market and affordable than Wahaca’s cool Mexican cantina format. 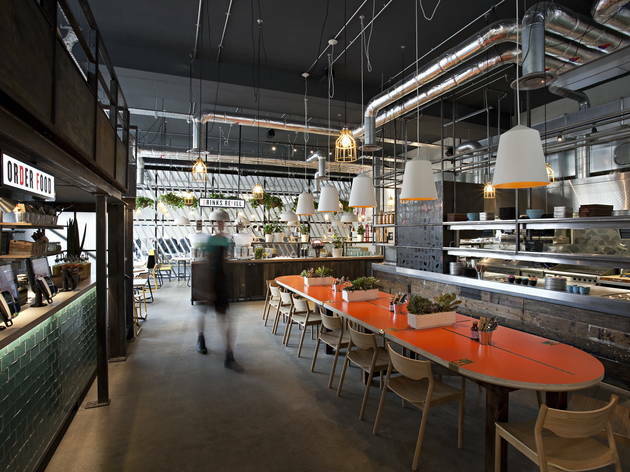 DF still bears a lot of Wahaca signatures – strikingly modern design, cheery staff, reservations not taken – and will be a long-running popup (until 2015 at least). It feels and looks like a pilot for a new chain in the making. How can DF be cheaper than Wahaca? No table ordering keeps staffing costs low. You sit down, leave your bag and jacket behind for opportunistic thieves to eye up, then queue at the counter to use the supermarket-style touchscreen. There are real humans working behind the tills too though, and they can take your order if the touchscreen drives you loco. But this part of the experience is about as much fun as being told you have an unidentified item in the bagging area. Then a human brings you your booze, you collect your soft drinks from the self-service coolers, and wend your way back through the forest of awkwardly-placed chair legs – the bag snatchers don’t have a chance, not even a couple of chihuahuas could get across this room without a headlong collision. So far, so what. 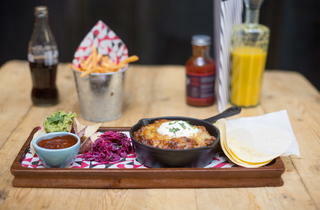 But the Wahaca crew have done a clever thing: conflated their expertise and experience of Mexican fast food with London’s current fetish for burgers, finger food and US-style grills, a penchant which Mexico City also shares. So if you order the exotic-sounding ‘pork bibil torta’, what arrives looks like a burger. 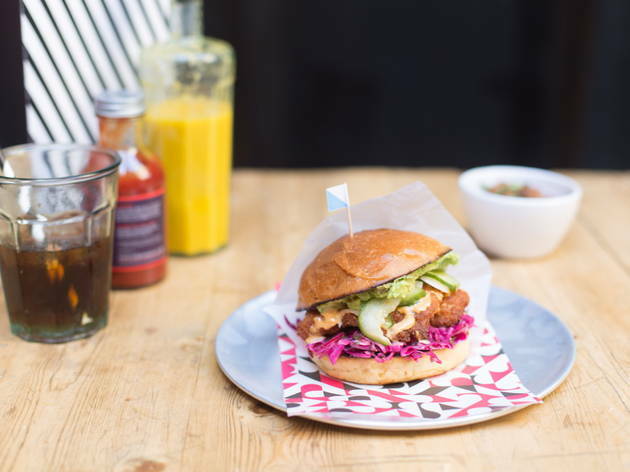 But the toasted brioche bun is filled with slow-cooked pork in a citrous Yucatan-style marinade, and comes with a spread of refried beans, sharp pickle and avocado – me gusta mucho. 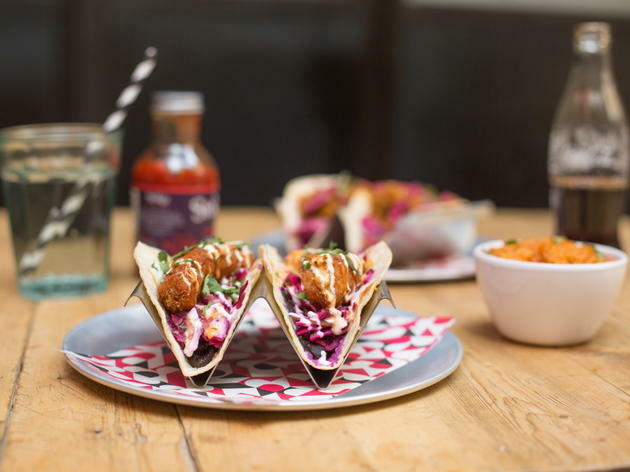 More recognisably Mexican are the tacos, served open, so that inside the face-flannel flatbreads you can see the colourful dressings of refried beans, yogurt, coriander leaves and – in our case – crumbed cod, like fish fingers. The fish is Marine Stewardship Council approved (hurrah! 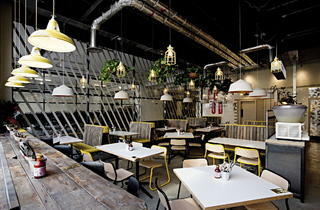 ); the Wahaca chain also consistently gets top ratings for sustainability from the Sustainable Restaurant Association. A dietician may take a dimmer view of our meal order though. I left feeling as if I’d eaten a week’s quota of salt, saturated fats and sugar in one meal. This, of course, is not just true of DF Mexico, but could equally well apply to a thousand other fast food joints in London, especially the burger joints. This is the catch with damn tasty food; it’ll cost you in other ways, maybe by taking years off your life, if you eat too much of it. Still, you’re going to die with a smile on your lips. 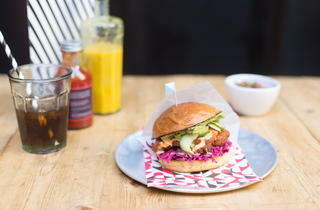 Meal for two with drinks and service: around £35. I really enjoyed this place. We rocked up on a Thursday night around 6:15 and immediately seated. The nice hostess explained the ordering to us and even then when I was confused at the screen someone came up and helped. I enjoyed my horchata immensely whilst my husband had a beer. Our nachos with guacamole came out quickly and was delicious. Decent size portion for two people and a good amount of guac. I had the make your own fajita with steak and cheese and ohhhh man was there cheese. The meat itself was deliciously tender and the smokey chipotle sauce a perfect accompaniment. I was quite happy with my selection. I had a bite of the chicken burrito the husband ordered, and although it looked a bit dry, it was tasty. Really good if you want a New York and Mexico fusion bite. The tortas (brioche burger type things) are a great size. And I eat here for the Bottomless non-alcoholic drinks alone. They're so yummy. The fried cod fish is amazing in a torta or a taco, but the steak is a great option if you're a meat lover. I don't recommend the sweet corn side dish, it tastes like it just came out of a can. The only way the mains could get better is if there were more guacamole! Definitely a leg up on the bog-standard burrito places that mostly represent Mexican food in London. The food is fresh and reasonably varied. 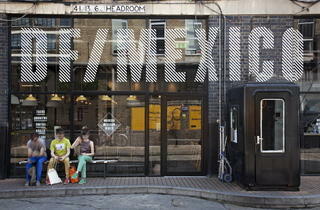 Tasty, quick and well priced Mexican food, at the centre of Brick Lane. The servings are generous (even more so if you go on a Monday for 1/2 price tacos). 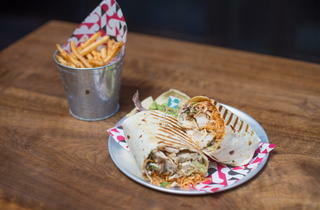 DF Mexico cater well for dietary requirements (Veg, DF and GF),just ask for the special menu. I would give DF Mexico five stars had it not been for the service, as the food was delicious (although I still prefer Wahaca). The concept is theoretically nice and easy. You show up, order at the till, pay and--boom-- you get your food. No fuss at checkout. That said, we were given table service as we were a big group and it was unfortunately lacking (and a bit confusing). The servers forgot my friend's food and when we all got our dishes (except her) she had to ask them to make it again. I also had to ask for my side of corn twice because it had also been forgotten. That said, the food is delicious. The guacamole is fresh and tasty and the tortilla chips are crunchy. I ordered two southwest fried chicken tacos and the portions are generous and well-priced. The slaw in the tacos was a bit too sharp for me and competed with the spicy mayo but otherwise it was a great meal. 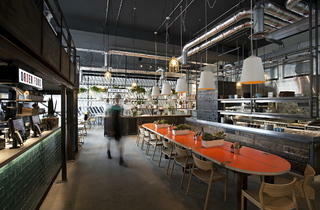 Great modern Mexican diner. Good sized tacos! 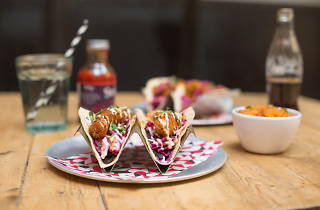 Great specials early in the week like 2 for 1 tacos! Think of this as the Nandos for Mexican food. Its a self serve Mexican offering a wide selection of menu options. 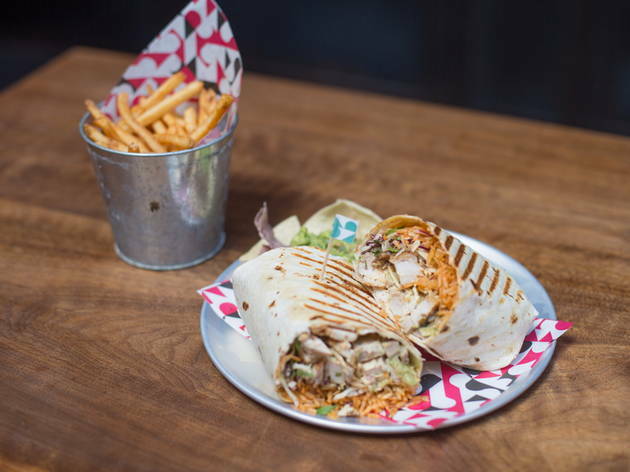 Now if you are coming here expecting the most authentic Mexican food you are obviously going to be a tad disappointed; just as you would be going to Nandos looking for the most authentic Portuguese food. 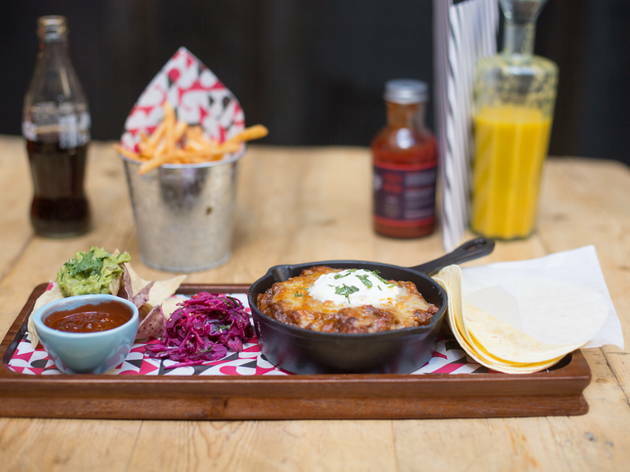 No one goes to Nandos for this - so don't get upset about D/F Mexico's take on Mexican food. Now don't in anyway let this put you off coming. I would highly recommend it - its a hearty and nice selection of Mexican style food, that beats any other Mexican fast food chain out there. The portion sizes are generous - even the 2 tacos (these are not normal tiny tacos here). But my personal favourite is the spicy pork burrito (with added guac of course) one of the weird things about this place is that when you add guac you dont get it mixed into the burrito like you usually would you get it in a bowl on the side. While I initially found this odd its actually a great way to do it - it doesnt cool the burrito down too much and allows you to slather it on per bite - and get the full delicious guac taste on every single one. Similar to Nandos you order at the bar (or just use a touch screen to do it yourself) then you grab your drinks nearby - they have a really nice range of drinks to choose from including hibiscus flavour. I have been to both branches of D/F Mexico and really enjoyed it both times. 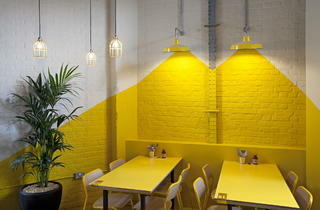 Tasty authentic Mexican food in a cool east London Eatery. The food is tasty and filling, but the service has not always been great - they have in a couple of occasions forgotten items and some parts have taken a long time to arrive, way after all the other items have arrived. Recently tried out the Tottenham Court Road branch of DF, and this definitely lived up to expectations. We shared the tacos and a burrito, and drank 2 raspberry & hibiscus frozen margaritas. It was amazing - so fresh and served so quick. I love the ordering system here, it adds to the relaxed vibe & the staff make you feel at home. The old school hip-hop is just a bonus really, and I will definitely be back. Hugely disappointed ! Ordered a Burrito and my honest review is that it was bland. To put this in perspective, my burrito was lacking the following: rice, chilli sauce and sour cream. I'm used to having to add guacamole as an extra but not the entire list of ingredients that define my favourite Mexican offering. This is less a burrito and more a "wrap". Preserve your untainted image of this beautiful meal and go elsewhere. 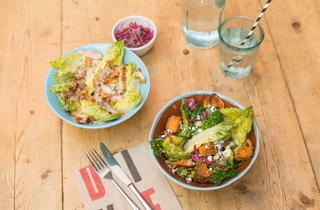 Wahaca mixed with Nando's is the best way I can describe this. Food comes out quickly and you are often on long sharing tables. Great for a quick bite to eat before heading off elsewhere. Can be in and out within 45 minutes easily. Is a safe, reliable choice in the area. 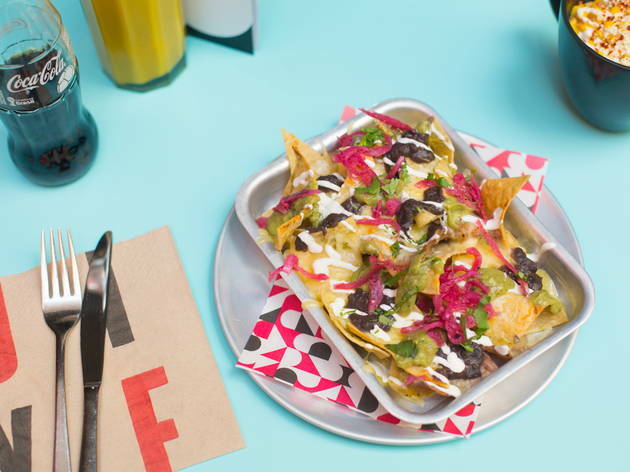 Mexican-accented eats served in so-now surroundings (industrial with splashes of yellow, signage highlighting the DF in the name everywhere: Dirty Fingers on the napkins, for instance) that make you forget this is essentially spruced-up fast food. The burritos are lighter than the average nap-inducing carb-fest, thanks to being lighter on rice. The mushroom torta (in a burger bun with chipotle mayo) is a better veggie option than the tacos, which lean too heavily on lettuce to fill them. The serve-yourself drinks station of aguas frescas (soft drinks) is a fun part of the experience, but it's the fries that keep you coming back for more – crisp and slightly oversalted, they'll make you a junk food junkie and you won't care.